Mathematics III incorporates advanced functions, trigonometry, and probability and statistics as students synthesize their prior knowledge and solve increasingly challenging problems. Students learn through discovery and application, developing the skills they need to break down complex challenges and demonstrate their knowledge in new situations. Course topics include formulating inferences and conclusions from data; polynomial, rational, and radical relationships; trigonometry of general triangles and trigonometric functions; and mathematical modeling. This course supports all students as they simultaneously develop computational fluency, deepen conceptual understanding, and apply Common Core’s eight mathematical practice skills. Students begin each lesson by discovering new concepts through guided instruction, and then confirm their understanding in an interactive, feedback-rich environment. Modeling activities equip students with tools for analyzing a variety of real-world scenarios and mathematical ideas. Journaling activities allow students to reason abstractly and quantitatively, construct arguments, critique reasoning, and communicate precisely. Performance tasks prepare students to synthesize their knowledge in novel, real-world scenarios and require that they make sense of multifaceted problems and persevere in solving them. Throughout the course students are evaluated through a diversity of assessments specifically designed to prepare them for the content, form, and depth of the Common Core assessments. 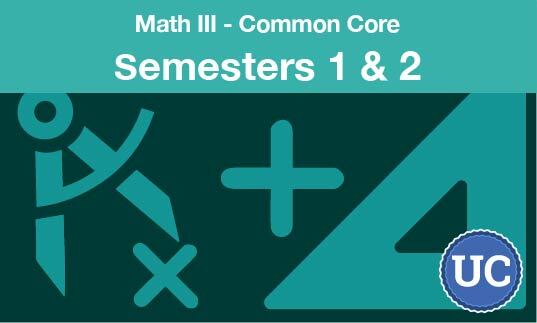 This course is aligned with the Common Core State Standards for Mathematics.